Oklahoma Connection | Russell came to Oklahoma in 1907. 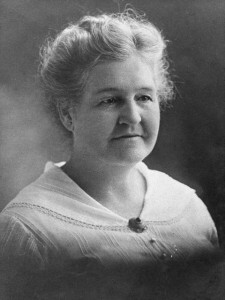 The first matron of the State Industrial School in Pauls Valley, Angie Russell was most famous as the founder of her State Industrial School for Girls in Oklahoma City in 1913. She used her own finances to provide equipment and maintain the school throughout her life. Angie Russell was instrumental in her role as a juvenile welfare leader across the state of Oklahoma for 40 years. She was born in New York and came to Oklahoma City in 1907, just before statehood. A prized speaker and worker in the Democratic Party, Roberts served as the Superintendent of Juveniles in Oklahoma and was active in the growing issues of welfare across the state.